I asked a couple of my soccer teammates if they have checked their credit score. Almost everyone said they haven’t. I wasn’t shocked but I was a little upset. Heck, one of my teammates wanted to get a new car for the summer using an auto loan. He had no idea about his credit score. Well, I heed about my credit score. So should you. Do you plan to buy a house or a new car in the near future? Your credit score is your BFF. Make sure you know what’s going on with your new BFF. Your credit score is an indicator of your debt or “borrowing” stability. It has nothing to do with your financial stability. Many mix it up, don’t be one of them. Every lender in Canada looks at this score and makes a decision. It is a 3-digit number that ranges from 300- 900. The higher the score – better for you and less risk for the lender. 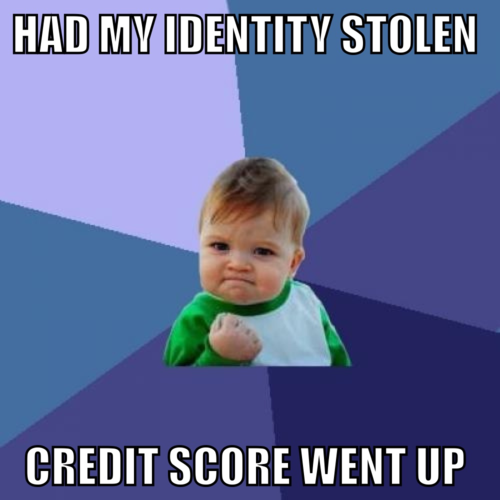 You can get your credit score from one of the two main credit-reporting agencies, Equifax and TransUnion. Now, many will suggest getting your score online or mailing your form to the credit-report agencies. Some just prefer to complain and take zero action. Listen up, crybabies. Oui, I am talking to you – my beautiful nursing classmates. Do what I did if you live in the 416, my fellow Torontonians. Go to 5700 Yonge Street and you should be able to find the Equifax branch office in a corner. I can guarantee you more than 90% of Torontonians have never heard or don’t know about this branch office. You are very welcome. I am an avid TTC user but I have yet to see an ad illustrating – Equifax has one of their branch offices located at Yonge and Finch. It is within a stone’s throw of Finch station. I waited in the line for about 10 minutes, paid $12.75 and I got my credit score. Make sure you have your S.I.N. card with you and your driver’s licence or citizenship card.Why wait for an entire week if you can obtain it in 10 minutes. And if you get your score online, Equifax will charge you $23.95. Want to know my score? Absolutely. It was 785. Not too shabby. For Hamiltonians, I was told you guys have a TransUnion office in Hamilton. Anyone been there? Some may argue you can get your credit score for free. False. You can obtain your credit report for free, not your credit score. I strongly suggest getting your credit report as well. It is free. Why not? It can give you an early picture in relation to where you stand with your loans and credit cards. There have been several cases of inaccurate information when people obtained their report. Yes, this can happen and has happened. Hence, make sure all the information is correct when you get your report. There are two ways to get a free credit report: by phone or through the mail. Let me be the hero and make it super easy for you. And, here are the forms if you want to avert long waits on the phone. Again for my fellow Torontonians, you can go to 5700 Yonge street and get your credit report only if you want. Yup, for free. Ever wondered why Rogers, Bell and all other major cell phone companies ask you if they can check your credit score when you get a cellphone plan. By now, you should have an idea. More importantly, if your credit score is poor, you might be denied to get an auto loan. Many lenders and sellers want to see a credit score well above 700 for them to offer an auto loan. Sure, some dealers will still provide you with the loan even if your credit score is poor. The catch? HUGE. You will have to pay a higher interest rate. Also, many mortgage lenders will want to see a minimum score of 680 to get the best interest rate. Still not convinced paying a higher interest rate will have a huge affect on your pocket. Think about paying it for amortization period of 25 or 30 years. Seriously, if you dont have a good credit score – getting a fair home loan can be difficult and it doesn’t matter if you are included in the province’s annual Sunshine List. Oh, remember my soccer teammates. I saw them a week later for our soccer game. I asked them again if they checked their credit score. They replied with a “No dude, let’s focus on the game”. I grimaced, thinking how can I convince them. Hey, we won the soccer game. My cortisol level dropped. P.s. – Personally, I have never used it but there is a new fin-tech company called Borrowell where you can get your credit score for free. Previous Post Why open a savings account with EQ Bank? Next Post Do You Yawn When You Hear Index Funds? Think Again.